Is the Yogo Foldable Yoga Mat the Right Mat for Your Travels? | My Five Acres. Travel. Adventure. Yoga. Is the Yogo Foldable Yoga Mat the Right Mat for Your Travels? Great design, ultimate portablility, and eco-friendly too! If you’re looking for a foldable yoga mat that combines beautiful design with clever functionality, put the Yogo travel mat on your shopping list. Read on to see if this is the right travel yoga mat for your adventures. What’s in our review of the Yogo foldable yoga mat? I’m glad to say my search for a great foldable yoga mat is over! As a full-time travelling yoga nerd, I have been looking for a mat that will take up minimal space in my suitcase — ut it also needs to be tough and sticky enough to handle frequent use. After hearing about the Yogo ultralight travel mat from several of Stephen’s students, I knew I had to try it out. The Yogo team kindly sent me one to try — and I’m happy to say it is my new mat of choice! I only have space for the best and most versatile gear in my carry-on suitcase and the Yogo definitely makes the grade. Plus, it has been a great help in getting me motivated to practice each morning, no matter where I am. Hurrah for that! Is the Yogo Foldable Yoga Mat Right for You? The Yogo travel mat comes in several colors and folds up to the size of the Sunday New York Times. Watch this promo video from Yogo to see the mat in action. Who should consider buying the Yogo mat? This mat is perfect for yogis who like to pack light but wouldn’t think of travelling without a yoga mat. If you’re looking for a super-portable super-sticky mat that you can take almost anywhere, this mat is great. The mat is ideal for all kinds of yoga, except for hot yoga. Who should not get the Yogo travel mat? If you’re into hot yoga or are super sweaty when you practice, this mat is probably not for you. When dry, it’s amazingly sticky, but can lose its grip when it gets wet. If you need a lot of cushioning, then a travel yoga mat is probably not right for you. Yogo — as in “yoga on the go” — folds up small to fit in your backpack or suitcase. The Yogo team only sells one product — their travel yoga mat. This single-minded dedication has really paid off. They’ve managed to create a unique travel yoga mat that is ideal for frequent travellers like me. This mat folds up smaller than most other travel yoga mats I’ve tried (though the Jade Yoga travel mat and the Manduka eKO Superlite both come close). When folded, a set of attached straps and clips hold it all in place. They’ve also come up with a clever folding strategy, so that the dirt from your practice surface — be it a yoga studio floor, hotel room, or a park — never comes in contact with the business side of your mat. You could fold any foldable yoga mat this way, but props to the Yogo team for coming up with the idea! Having an eco-friendly yoga mat is non-negotiable for me. Who wants to explore their inner landscape while practice on a piece of plastic that ultimately destroys the earth? From what I can tell, the Yogo team are doing a good job of keeping their eco impact to a minimum. The Yogo mat is made from natural tree rubber, which, in case you’re wondering, is tapped from trees kind of like maple syrup. This means that the trees are kept alive and can keep producing liquid latex season after season. Like any natural rubber mat, the raw liquid latex is mixed with preservatives and natural ingredients to stabilize it into the firm-yet-squishy mat material you know and love. Yogo’s Asia-based factory is FSC Certified, and carries ISO 14001 and 801 certifications, meaning they have a plan in place to limit negative impact on the environment. They are also working towards partnering exclusively with FSC Certified rubber plantations in the future. Finally, because they are made from natural rubber, Yogo mats biodegrade if disposed of properly — but we think you’ll want to keep yours for a long time to come. The Yogo mat is just a little bigger than my travel pillow and my comfy sweatshirt. 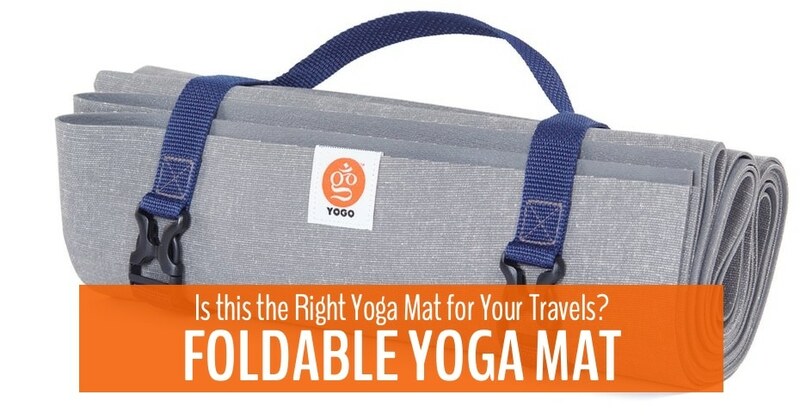 No other travel mat I’ve seen matches the Yogo for portability. It folds up to about the size of a weekend edition newspaper (remember those? ), or a cozy sweatshirt. The attached straps help to keep the mat compact when it’s in your luggage or bag. Since I’ve only had it for about a month now, I can’t say exactly how it will hold up the rigours of the road. So far, it seems less stretchy than the Jade Voyager and a little tougher than the Manduka eKO Superlite. Yogo says their mat is designed to last 5 years, even with regular practice — I’ll let you know in 5 years how this works out! You don’t have to just use this mat for travel, either. If you commute, you can throw this in your bag and then use it on top of a studio mat at your local yoga studio. This will give you extra padding while you still get the “at home” feeling of practicing on your own personal mat. The Yogo foldable mat works for travel and commuting. Who doesn’t want a cute yoga mat clipped to their backpack? After having practiced on a slightly slippery mat for the past few months, the stickiness of the Yogo travel mat is a revelation. There is no chance of slipping on this super sticky mat. It is the best non-slip yoga mat I’ve used in a long while. So far, I have only used it with super-dry hands and feet (hello, winter in Canada), so haven’t been able to test out how it performs with a little sweat. The YOGO Mat is the stickiest mat you can buy. It will stay stickier than other mats in hot yoga up until a certain moisture level — then it is safer to use a yoga towel. If you’re a super-sweaty yogi or you like to do hot yoga, check out the YogaDesignLab travel mat. The surface feels nice under my hand and feet, but of course, just like all the very portable yoga mats, there is no cushioning at all. If you have sensitive knees and elbows, you’ll probably want a thicker mat. The Yogo doesn’t have any padding built in, but can be placed on top of a regular mat once you get to the studio. The Yogo team partners with two NGOs. The first is Trees for the Future, with whom they partner to plant a food tree for every mat sold. The second is Sustainable Harvest International, who work with impoverished rural communities to help them farm sustainably. These initiatives help support poor communities by creating a sustainable source of food, while also helping to protect and restore the environment. The Yogo team recommends that, when folding your mat, you start by folding it right down the middle. That’s how it came shipped to me. Unfortunately, this fold leaves a big crease right down the middle of the mat which, so far, has not disappeared. Since I will be travelling with it folded almost all the time, I suspect this crease is something I’ll have to learn to live with. OK, this is a weird one, right? Who licks their yoga mat? Well, don’t worry, I didn’t get down there and taste it! But, after my first few early morning practices, I noticed that the peanut butter I licked from my fingers during breakfast (table manners!) had a yucky bitter taste. It took me a few days to realize that this was coming from my yoga mat. I assume this comes from the natural rubber, which is not a fragrant substance in nature! I assume this will disappear after a few washes, but until then, I won’t be using my mat as a picnic blanket! The attached straps are my favourite feature of the Yogo foldable yoga mat. They really keep it snug in my luggage. Having said that, they can be a little annoying during a few poses, especially those where you need to stretch out fully on your mat. During shalambasana, I sometimes have to shift around to avoid the buckles! I don’t know about you, but I hate rolling up heavy yoga mats. Much better to fold, clip, and be gone! Who else hates cleaning a yoga mat? I know I do. Mat sprays make me sneeze and how clean can it be after rubbing the sweat around with a cloth for a few minutes? One of the great benefits of the Yogo is that it’s designed to be rinsed in the shower every few practices. That is so much easier than getting down on your hands and knees to scrub away. Once it’s clean, you can use the built-in straps to hang it in the shower until it’s dry. I’ve washed mine a couple of times and it only took an hour or two to dry. For a deep clean, the company recommends using natural Castile soap before rinsing and hanging it to dry. I can’t imagine this super-sticky mat ever getting slippery, but if it does, they recommend spraying and wiping it with a vinegar solution and allowing it to dry. So far, this is the best travel yoga mat I have tried, and I have tried many. It combines clever eco-friendly design with excellent functionality. I suspect it will be a part of my core travel kit for a long time to come. If you’re looking for a folding yoga mat that is ultra-portable, very sticky, environmentally friendly and easy to wash, then put the Yogo mat on your wish list. 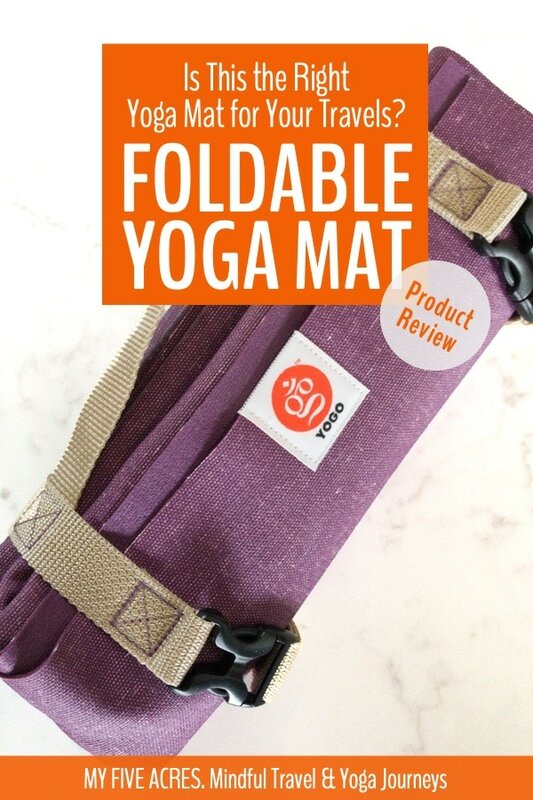 I hope this review helps you decide if the Yogo foldable yoga mat is right for your travels. As always, we only review products we use and love! If you have questions, please ask on Stephen’s yoga Facebook page. Pin this for your yoga travels. Tagged travel gear, yoga travel. Pingback: Your Guide to the Best Amsterdam Yoga Studios for Your Style and Practice | My Five Acres. Travel. Adventure. Yoga. Pingback: The 7 Best Travel Yoga Mats for Your Mindful Adventures (2019 Update) | My Five Acres. Travel. Adventure. Yoga. 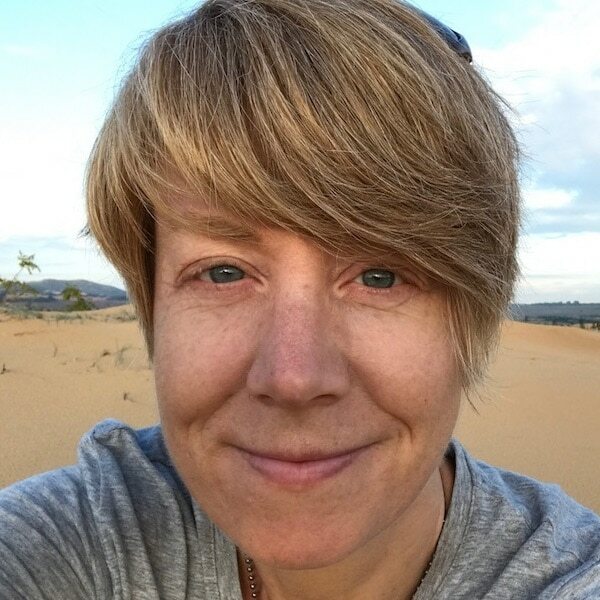 Pingback: Should You Go On A Yoga Retreat? | My Five Acres. Travel. Adventure. Yoga.